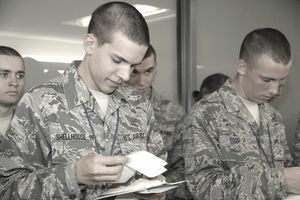 A day or two after arrival at Air Force Basic Military Training (AFBMT), you'll learn your mailing address. On the Sunday or Monday following arrival, you should get a chance to call home, and let your loved ones know your new address. You'll also fill out a postcard to mail to your loved ones, as soon as you get your address. For all of the squadrons, except for the 319th and 324th, the unit # begins with "36," and the last 4 digits depend on the squadron assigned to and the dormitory assigned. Don't get too wrapped up over the addresses, even if one of the examples look a little different than what you heard over the phone. Even if pieces of the address are wrong or missing, your letter will still get there. As long as you have the name, squadron, flight, Lackland AFB, and the first five numbers of the zip code on the envelope, the letter will get to the recruit (it just may take a day or two longer). If all else fails, a week (or so) after arrival, your address is listed at the Lackland AFB Basic Training Reception Center. Your family can call the center at (210) 671-3024 and get your address. They will need to know your social security number and full name. Which Leadership Positions Are Available in Air Force Basic Training? What Do the Air Force Basic Training Ribbons Mean? Why Would I Be Recycled During Air Force Training? How Can You Become an Honor Graduate in Air Force Basic Training?